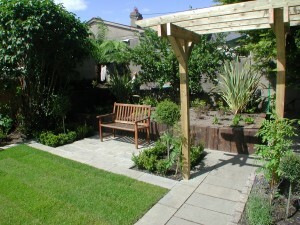 This garden design took approximately 2 weeks to complete. 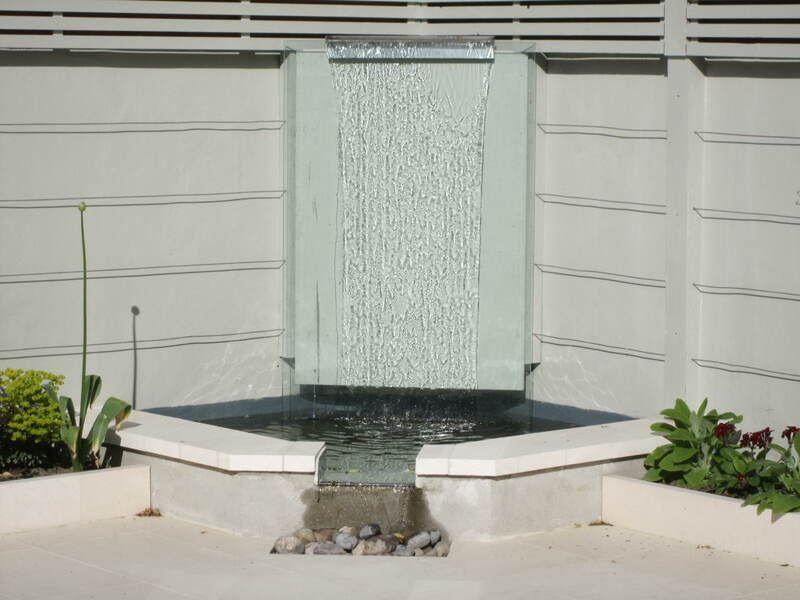 The design was accepted by the client as it came within budget, looked well and met all his expectations. Our landscapers started by removing the old concrete patio by house. This was the area with the drainage problem. Stainless steel grid drainage was laid along the side of the house and run to to nearest outlet using 4” waving piping. 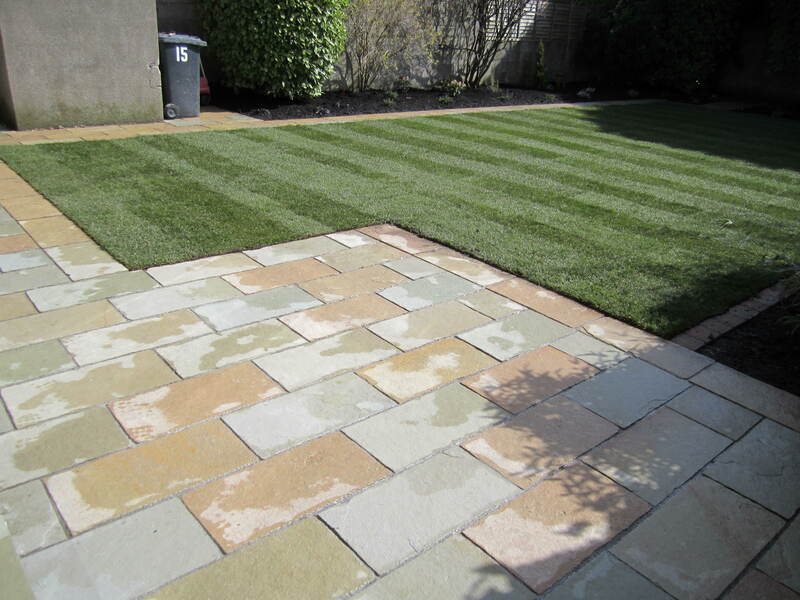 Quarry screenings were then laid over the whole area, compacted and a Camel Dust Indian sandstone patio laid. 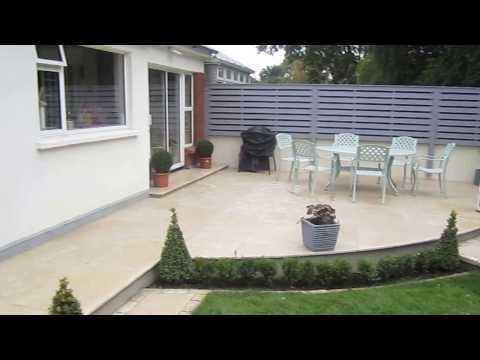 Camel Dust is is the best of all the Indian sandstones as it is a dense stone and less susceptible to staining, I would however recommend sealing as with all Indian sandstones. 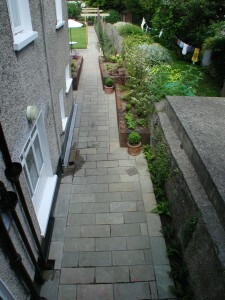 The old concrete path was then removed and a new path installed using camel Dust Indian sandstone paving. 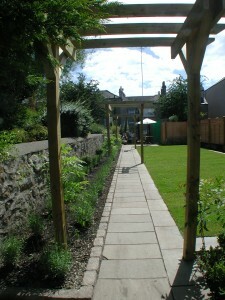 Along the path 3 pergolas were installed at 3M intervals using pressure treated timber of varying sizes. 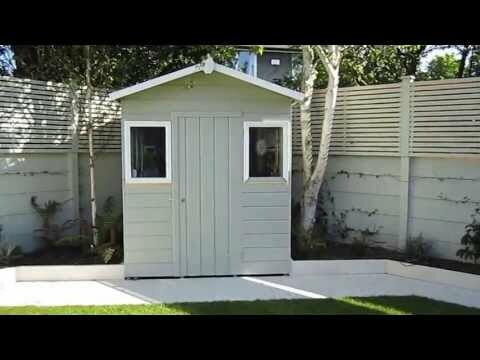 The pergolas gave height to the garden, framed the path and uprights to extend the 20M re-tractible clothes line between. 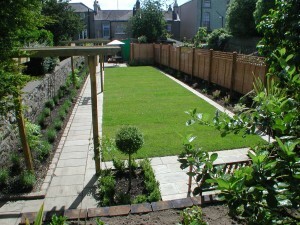 The raised beds were then installed using railway sleepers laid vertically, installing the sleepers vertically looks far better than laying horizontally. Raised beds add height and present the plants better especially trailing plants which flow down from height over the side of the bed. The bed along the main path was given height also by using brown granite cobbles laid end to end which also gave a nice contrast of materials. 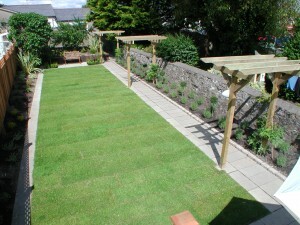 The other beds were created using 300×600 slabs which would double up as a mowing edge and path. 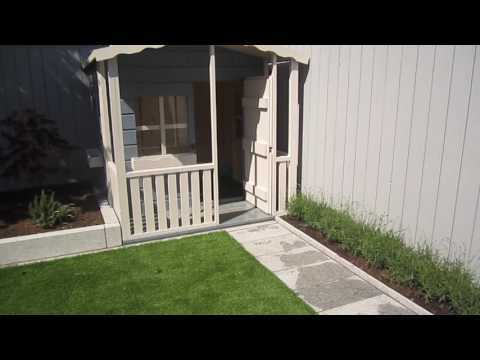 Between the path and mowing edge the instant roll out lawn was installed. Before laying the the area was sprayed with roundup and a 2” layer of screened soil and sand mix was spread to make good bed for the sod. There was no fence separating this garden from the neighbours on one side so we set about installing 4×4 pressure treated posts into concrete at 2M intervals along the boundary. The fence was completed 2 days later installing 6×5 fencing panels between the posts. The top of the fence was finished using 6×1 trellis sections to give a framework for climbers in the future. 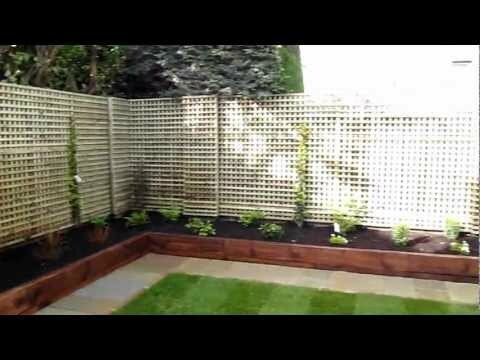 The 4×4 posts were then cut 2” above the trellis level and capped using chamfered 6”x6” squares which created a nice effect. The old wall running along the North side of this property had many holes and crevasses which was harbouring hundreds of snails. The snails were removed and let go in the Wicklow mountains. Our landscapers then re-pointed the whole wall so other snails wouldn’t come and take up residency. Screened topsoil was then imported and used to fill raised beds and bring up levels. 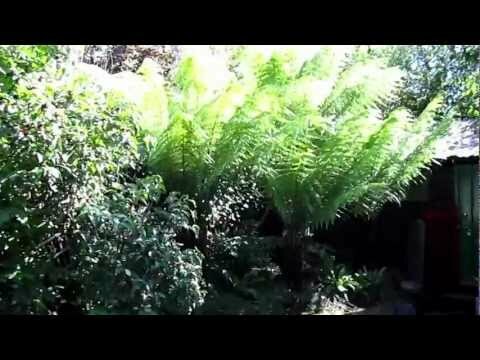 All beds were then planted with suitable trees, shrubs, perennials and climbers including Phormiun ‘Cream Delight, Polystichum spp., Dicksonia antartica, Cordyline australis ‘Purpurea’, Wisteria sinensis, Heuchera ‘Purple Palace’, Genista Lydia, Buxus sempervirens, Lonicera standards, Acer palmatum ‘Atropurpurea’, Pittosporum ‘Tom Thumb’, Sorbus aucuparia ‘Joseph Rock’ etc. This contract looked very well and came within budget. 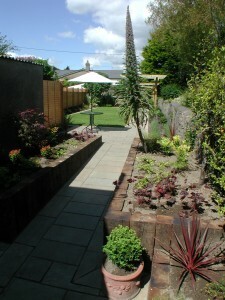 If you like what you see and require a quality landscaping service contact Kevin Baumann 086 8198444. 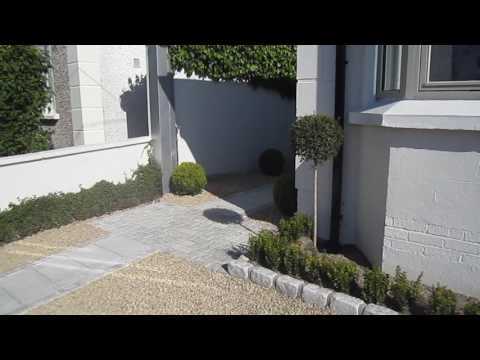 Previous: Low Maintenance Garden Design, Clonsilla, Dublin.